ZNS Series Pressure Screen is one paper pulp continuously screening equipment with pressure under completely closed condition. During operation, pulp flows along inlet pipe’s tangential direction into separation chamber which is on the top of the machine. 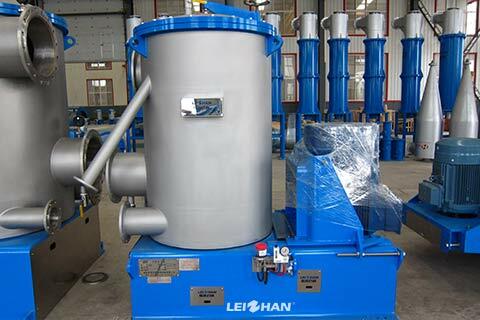 Heavy impurities are separated in the effect of centrifugal force, then will subside in Heavy slag tank and be discharges from heavy slag mouth. Pulp overflow round-shape flash board and flow into the screening area between screen basket and rotating barrel. Qualified fiber will flow through screen basket and be discharged from accept mouth. Unqualified fiber will move downward to the tank bottom and discharged from slag pipe. There is the dilution pipe against the slag pipe, it is used to adjust tailing pulp consistency. There are many raised blades are welded on turbine inside the screen basket, when rotating ,each blade will generate negative pressure, which can clean the screen basket and prevent blocking it . Input pressure is normally between 0.1MPa～0.4MPa, the pressure difference of inlet and outlet is between 0.01MPa～0.03MPa. While the data is related to pulp kind, pulp quality, pulp consistency, pulp flow speed and aperture ratio of screen basket etc.